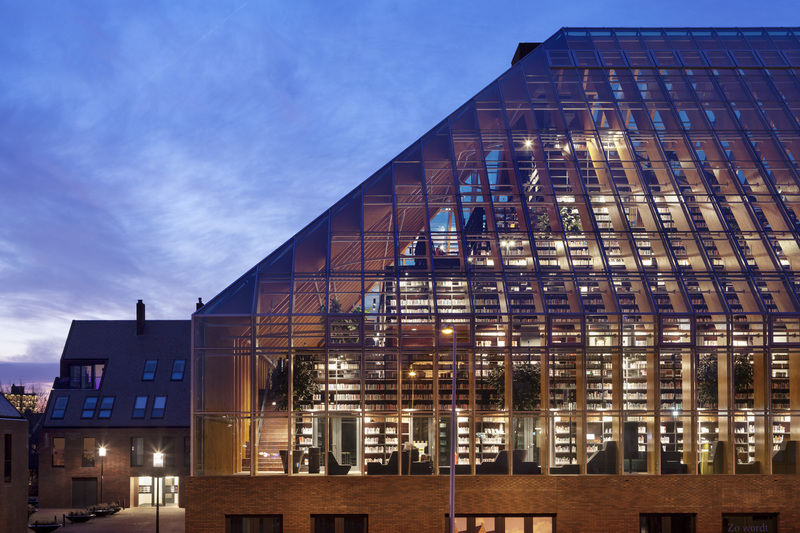 In the centre of Spijkenisse, in the Netherlands, is a glass pyramid containing a multi-purpose library of great evocative power, a pyramid made of glass and glulam timber. We are normally used to seeing glass together with steel, but here MVRDV combines it with glulam timber for a number of reasons. One of these was the fact that the public authorities wanted to build a construction that would be inviting rather than threatening, of essential importance for eliminating the 10% illiteracy rate that still persists among the population. And so it was necessary to allocate a number of functions into the library in addition to simply storing and lending books: the building contains an environmental education centre, a chess club, an auditorium, meeting rooms, business offices and shops, all on a small scale that is convenient to work with and use. The building’s transparent walls reveal its primary function as a library, but it is in actual fact much more than this. 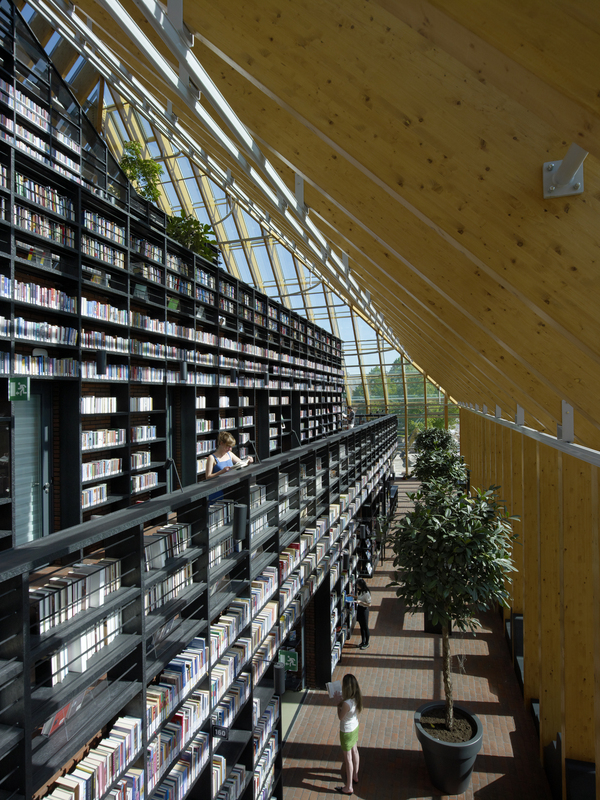 The underground parking level and the cosiness of wood make the library easy to heat in winter, thanks to the greenhouse effect, while it is kept cool by natural ventilation in summer. A series of photovoltaic panels ensures that the complex consumes clean energy. In short, everything is sustainable and saves on consumption of materials, in that many of the details of the furniture are made out of recycled items, and a lot of attention has clearly been dedicated to every aspect of its design. Including, last but not least, the building’s size. Taking into account that the library is about 20 metres high, the beams measure about 90cm and have a constant, never tapered rectangular cross section, the internal volume has great expressive power, proportionate to its image when seen from the outside. The 55 m by 40 m rectangular sides make it look like a large building, and it would be if it were a parallelepiped, but in actual fact it tapers into a pyramid shape, making the building lightweight despite its large amount of total floor space, 9,300 sqm. The library occupies 5,300 sqm, the environmental education centre 112 sqm, the chess club 140 sqm and the shops 839 sqm. 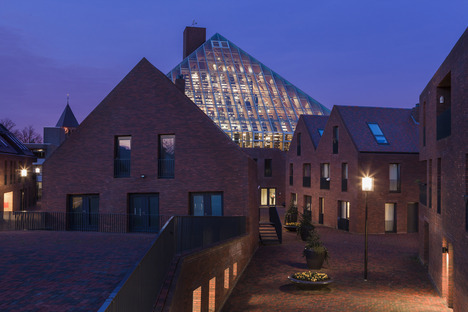 MVRDV’s Crystal House: a glass brick façade.